It is soooo quiet here today! It is the first time in 7 weeks that we do not have builders in the house and rather weird! I find it incredible how quickly we adapt to our environment and the various noises that it brings with it. I am not complaining - it is wonderful, but very different. Our build is not yet finished, but with the festive season on our doorstep all the work is going down a notch. We will also be doing most of the work ourselves from here on in, so we will only have the possibility to work on the reno when we have a couple of hours to spare. Taking advantage of the stillness and the cleanish floorspace I have taken my photo for today to incorporate my spinning wheel. I have had this wheel for quite a while now (roughly 2 years :O) and have only sat in front of it a couple of times - purely because I kept getting frustrated as it just did not want to do what I wanted of it! Apparently you can start to call yourself a spinner once you have spun about 1kg of yarn - well I still have roughly 950g to go :D LOL! Let me tell you about this week's WIPs. They have grown a little since last week and I am hoping to get some more done on them today. 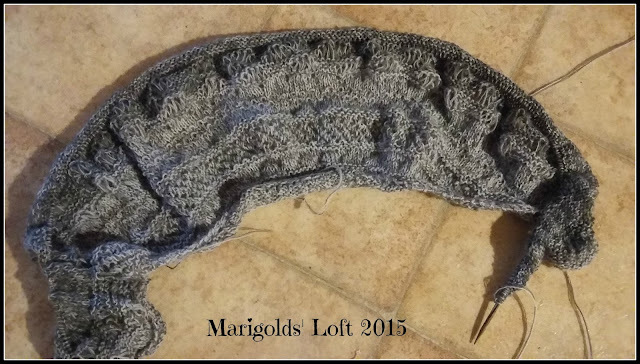 I am enjoying the pattern and do hope to have them done in time for her birthday. Do be sure to share your gorgeous pics, all finished shawls will be in the running to win a ball of beautiful Rainbow yarn from Andrea @ Wollehimmel. The Shawl looks very promising! I am curious now. One is happening here as well :-) Best regards! Everything looks great. :) Keep up the good work. 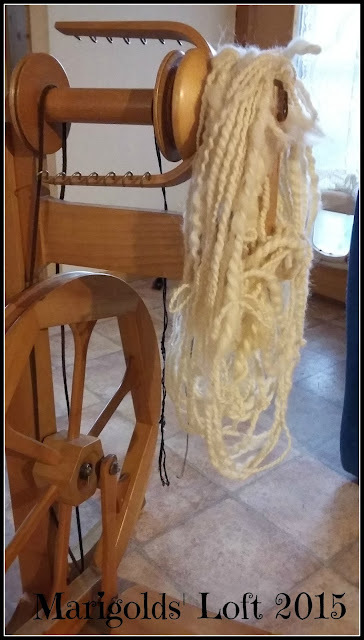 Spinning is a frustrating process in the beginning. And I'm sure people have told you, but save that yarn you are spinning - you may find it hard to spin that thick ever again! One day it just "clicks" and you become a spinner. I love those socks. Very pretty shades of green. First I considered giving my first yarn away, but the more I hold it, the more I love it and am planning on knitting something special with it to keep it with me and be able to wear as a keepsake. The shawl looks so light and airy! I guess it will really bloom after blocking! Yes, it is wonderfully light and so easy to take along with me, which is usually where I have been doing some of my knitting on it. I look forward to seeing some of the other finished shawls in all their glory on Monday, I would have liked to have mine done by then too but I really don't think mine will be off the needles and blocked in time. Your spinning looks fantastic. 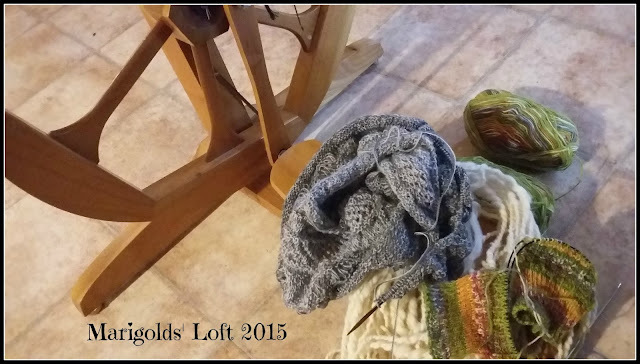 Once you get used to spinning you'll find it more difficult to make the "designer" Yarn you made. I took mine and crocheted it into a granny square blanket. It's amazing the difference from the centre to the outside. I'm still way off being a spinner but you'll find the techniques you enjoy more. I can't wait to see your journey! Spinning takes awhile, but the more you do the better the yarn [spun] looks. keep going! 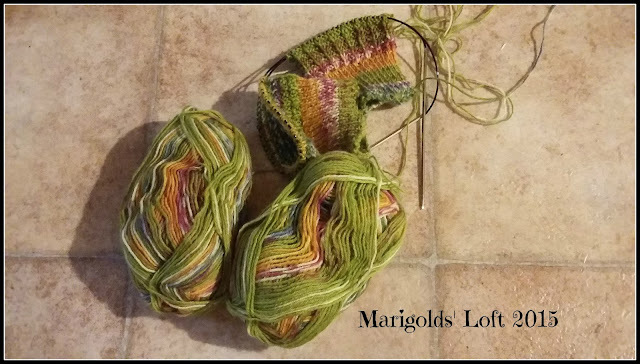 I love the tarns that you are knitting. So pretty. I hope to learn to spin someday also. Keep it up. As usual practice makes perfect.